Pac-Kit Saddlebags is your online source for premium leather saddlebags and accessories for your Harley-Davidson. Pac-Kit Saddlebags is the proud home of the "Big Bertha”. All Pac-Kit products are hand made in Battle Creek, Michigan using only the finest 8-9 ounce Texas steer hides that are drum dyed and UV protected for superior durability in the elements. All of our Bolt-on bags are reinforced to maintain their shape and all of our bags are built using premium American made buckles and hardware. We offer full custom services as well. 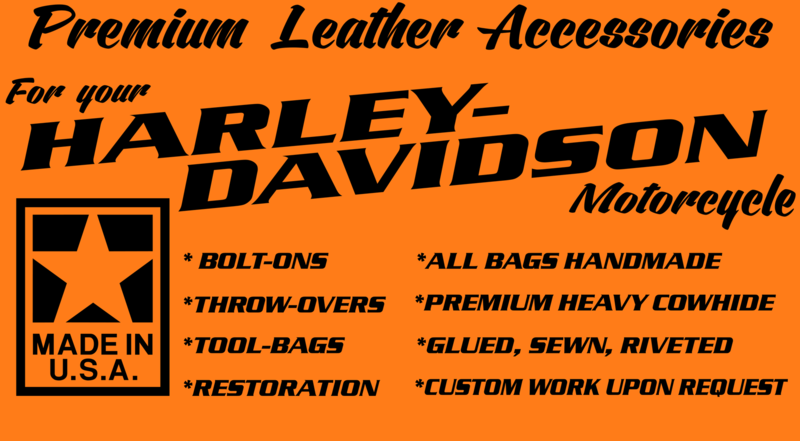 With over 40 years of continuous service you just can’t find a better made saddlebag for your Harley-Davidson. Quality, Service, and Customer Satisfaction is our #1 priority at Pac-Kit Saddlebags. Browse our products, order online, or if you any questions feel free to contact us. When you purchase your Bolt-on Saddlebags please add your free tool bag of choice in the comments section at checkout. We’ve got direct fit saddlebags for nearly every Harley Davidson. Sportsters, Dynas, Softails, Rigids and more. Our Throw-over saddlebags are rugged and dependable, many universal styles to choose from. No Harley should be without a toolbag or windshield bag. Choose from many styles as well as sissy bar bags. Our accessories include conchos, footboard fringe, dresser fringe kits, and mounting brackets. Custom built saddlebags, restoration and repair services. As well as custom cutting and embossing services. Some Harley’s just the way you like them, dressed in leather. Send us your pictures.